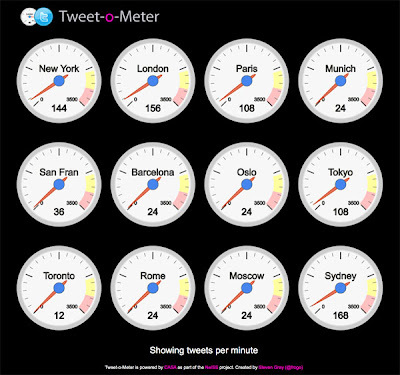 Our Tweet-o-Meter which keeps track of tweets per minute within a 30km area of New York, London, Paris, Munich, San Francisco, Barcelona, Oslo, Tokyo, Toronto, Rome, Moscow and Sydney, now features graphs. 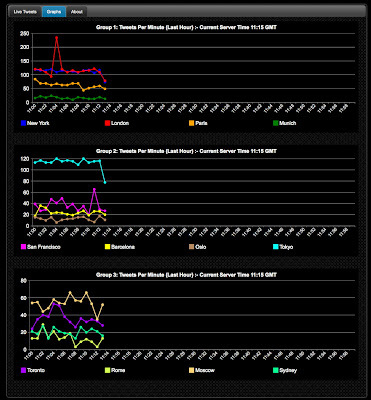 We are currently running dynamic graphs for each city over the last hour with 24 hour graphs online next week. The results are interesting, London is just ahead of with New York on number of tweets with Oslo, Rome and Sydney in the lower ranks. Currently in beta, the meter is part of our wider 'Ask' tool which will allows anyone to 'mine' data from Twitter or carry out a survey of either the world, a continent, a nation, a city or a local area. In short, we think it has notable potential for social science and the analysis of trends and relationships in a variety of areas. We have run various beta tests on data collection with the main mining process starting next week over a 24 hour period. We aim to collect all tweets with a geo-location tag in the above cities, this is a large amount of data allowing various social, spatial and temporal analysis to be carried out. The system is under development here at CASA as part of a wider survey tool as part of the NeISS project being coded by Steven Gray in association with Urban Tick, currently carrying out analysis on the data sampled so far. Analog Tweet-O-Meter from Benjamin Blundell on Vimeo.